If you didnt make it to the fantastic 'Alternate Woodland Critter Evolution Fan Fiction' group exhibition you really missed out big time. 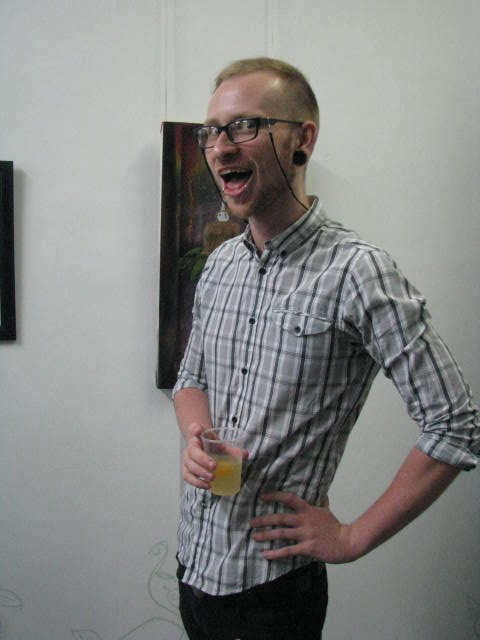 However, all is not lost, you can still find out some tasty details about the curator, Logan Knight and take a peek at some photos from the opening night! Our new writer, Emily Mitchell, interviewed Logan on the eve of his exhibition and the full interview is right here! ENJOY! Alternate Woodland Critter Evolution Fan Fiction provokes a frenzy of imagination and creativity in which works are featured and curated by Logan Knight, with some additions by Rose Turner, Sarah Mould, Jessica Louttit, Sarah Dunn, Ry Wilkin, Grant Hunter and Alex Masterson. 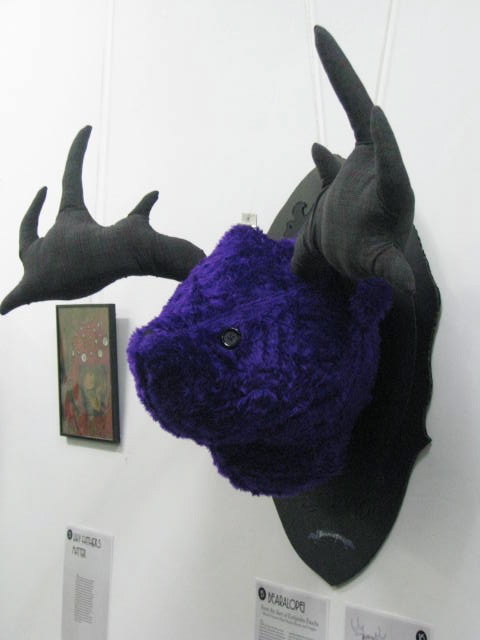 "I wanted to make a giant mounted plush head to hang somewhere in the gallery as decoration, but figured that if I was going to go that far I might as well organise an exhibition. So I did." 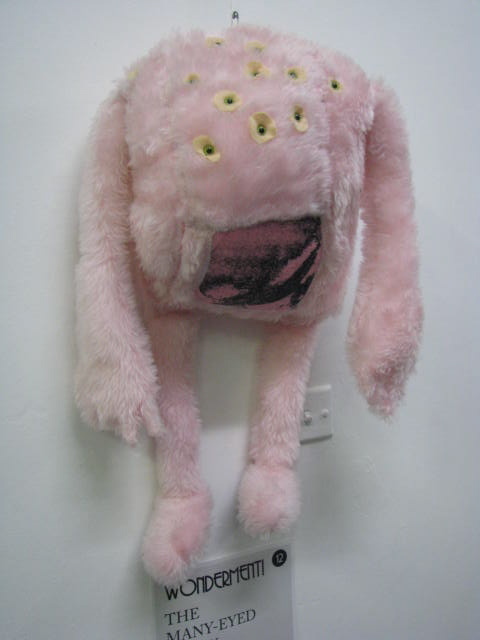 Logan Knight's latest exhibition which opens at ARThive on the 18 March at 7pm is a collection of all the creative things he enjoys...which is where the title Alternate Woodland Critter Evolution Fan Fiction originated from. Logan relishes in creating cute, furry, animal critter friends especially when they become so interesting that they "erupt with tentacles and disease!" Sometimes the life of critters can be a little humdrum so taking matters into his own hands, Logan created his own happy place and combined these furry little guys with some truly enthralling fan fiction. Each work will feature a short narrative where the viewer will be bewitched and led into some sort of creeping, crawling undergrowth of darkness, only to discover that the new species of 'Arachnowl' has adopted the power of webbing its enemies! Other contributions to the critter extravaganza include Rose Turner, Sarah Mould, Jessica Louttit, Sarah Dunn, Ry Wilkin, Grant Hunter and Alex Masterson. Each of the works feature a short piece of writing about the artists' creature and infact is available for sale in an assortment of little zines. "That’s the Fan Fiction part of Alternate Woodland Critter Evolution Fan Fiction," exclaims Logan. Q and A with Logan Knight. Who (personally or favourite artist) is your biggest influence? Do you have a muse? Life? Is life a muse? There are definitely people - both professionally and personally - that influence what I want to make, both with ideas or just filling me with desire to create, but again, there are far too many to really single one out. My biggest influence changes day to day and sometimes it’s not even a person. Why did you choose ARThive? Short answer because it’s run by brilliant attractive people that I’m quite fond of. Long answer because it’s actually a really good space, where it’s thankfully possible for people to do something that’s maybe a little bit odd just because it will be fun. Does your mother know you’re here? She’s most likely here too, so I hope so, otherwise she may have the dementia. She was supportive when I started making toys under the name Cot Death Toys, so I don’t think there’s too much I could do that she wouldn’t be okay with. Multiple choice question…What is your motivation for the exhibition? B. To fulfill a need to create. C. To spread your name. Have you only ever exhibited in Newcastle? Can you describe this exhibition in a sentence? I don’t think there’s a better description than Alternate Woodland Critter Evolution Fan Fiction, it’s kind of all there. Do you have a blog or your own website we can contact you on? Will there be lots of free alcohol and food on opening night? Hopefully, otherwise people might start eating each other. 'Stellated Octahedrons', an exhibition displaying the treatment of a geometrical object over a wide range of artistic disciplines. This show will bring together both two-dimensional and structural objects, exploring the possibilities of modular origami. The artist has created hundreds of fractions and facets, each more intricate than the next. While Fitzpatrick's work is informed by the rigid process of geometry and mathematics her output is highly refined and transcendent. 'Stellated Octahedrons' is a show for lovers of contemporary and and abstract work with a delicate touch. 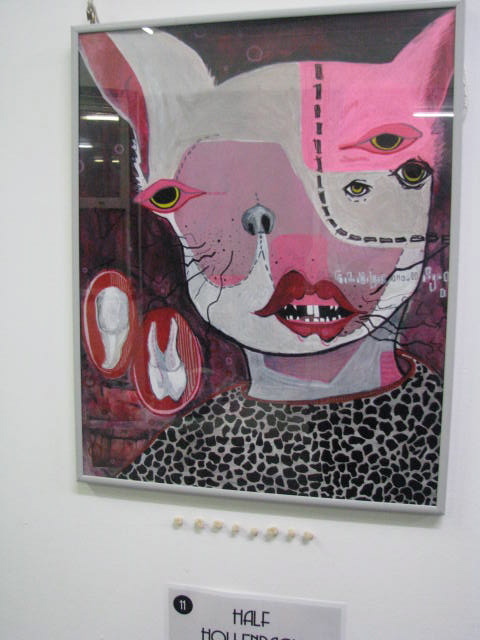 DAg ARt remove the Celebrity Story exhibition from the gallery, really really fast! Here is a rad process video of Alex Ball and Ben Foster painting up the wall across the street from the gallery. There's a few shots of ARThive's Lance Johnson helping out too! Street Art Walking are currently accepting expressions of interest from artists interested in creating work of this scale on the front and side of OUR building now, it's funded so get to it! It's not often that opportunities like this come around in Newcastle. The deadline for proposals is March 21. For more information click HERE. After a brief break in which we did some renovations on the gallery floor, we're back this weekend with two big events worth checking out. First up on Friday night there will be the opening of the Logan Knight curated Alternate Woodland Critter Evolution Fan Fiction show. 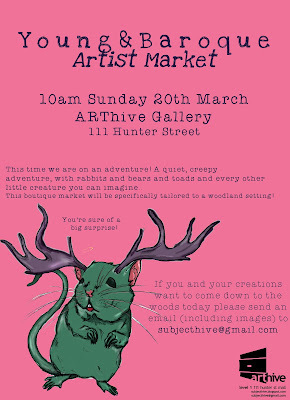 It's shaping up to be a very creepy, crawly, friendly and furry show so come and check it out! There's also a new solo show by our friend Trevor Dickinson up at the John Paynter Gallery further up the mall at 90 Hunter Street, so why not double dip and make a night of it? Here's what's happening with us. Following that we have the third installment of the Young And Baroque Artist Markets this Sunday March 20. It starts at 10 am and will continue through the day with more stallholders than ever before, this time themed to coincide with the current exhibition. One the day you can expect to see great woodlandy stuff from the likes of Emily Mitchell, Annalise Koche, Tallulah Cunningham, Sarah Harris, Amelia Sayers, Emma Lee Crane, Carly Brett, plus the usual Arthive crew including Rose Turner, Sarah Mould, Jessica Louttit, Grant Hunter, Logan Knight will probably have some cool stuff floating around too. Come and check it out! Street Art Walking (SAW) is the latest project from former ARThive co-director Simone Sheridan. SAW wants the city to come alive with artworks, dispersed throughout the streets, creating a public art walk for all to enjoy, locals and tourists. Our main goal is to bring back a sense of pride within our streets, while showcasing artistic talent. You may have already seen the great works in Morgan Street just out the front of ARThive Gallery. We think the mall is looking better than ever and want to see more of this happening. Fortunately Simone has negotiated to have access to the front and side walls of our building for large scale public art projects! 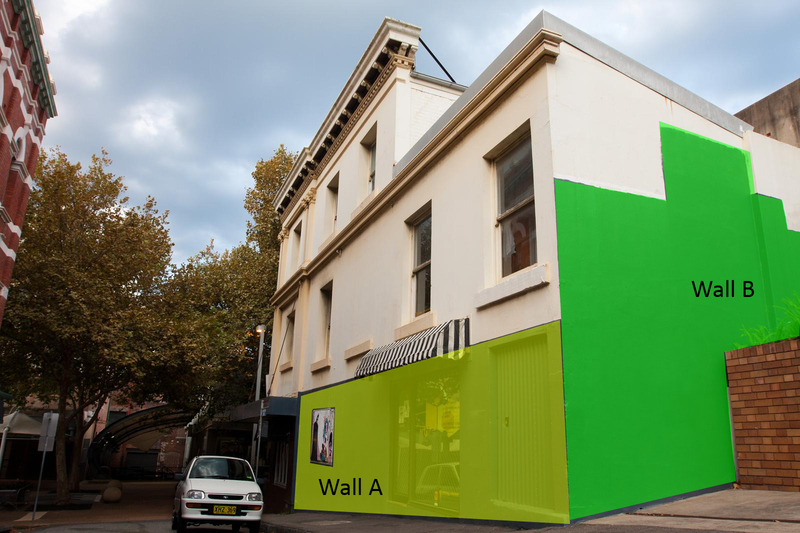 Interested artists are asked to apply to have access to either the main wall facing Morgan Street where our access door is, or the side wall facing Renew Newcastle HQ and King Street. SAW are now calling out for artists to submit expressions of interest and design concepts. You could show off your work REALLY REALLY BIG for all of Newcastle to see, and be a part of what's becoming the hottest little side street in the east end of town. Project Brief: The Octapod Association and Street Art Walking (SAW) have been given the opportunity to curate a new project, featuring two large public art walls. We are calling for artists to send Expressions of Interest from individuals or artists collectives to create a positive public artwork around the local Renew Newcastle artist-run space ARThive. This is an exciting chance for you to expose your work to a large number of people in the arts (and wider) community. We want artworks’ that life the profile of the public space with bright and positive imagery for all to enjoy. Materials: Artworks are to be made for temporary installation and artists will need to specify exactly what materials they will use to create the artwork. So far, we have worked with outdoor house paint and good quality aerosol paints. 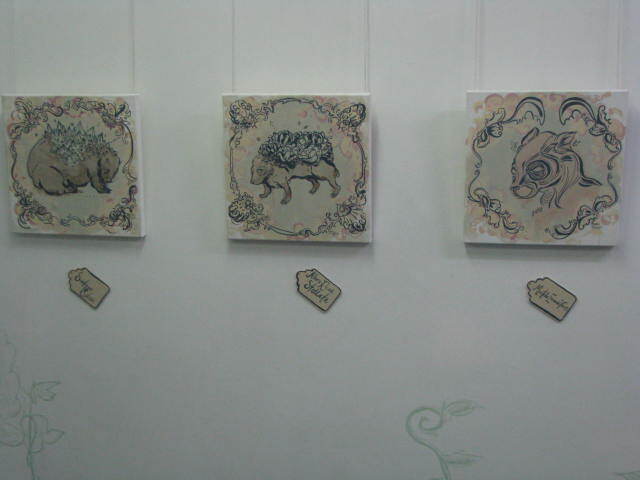 This space is to be left free from the project, as it is an ARThive promotional tool and space for exhibiting artists. We would like artists to propose a design that incorporates this negative rectangle space, considering the fact that the ARThive notice board will change in design often. Although we have divided the project into two parts, both walls can be painted as one large project. Please specify which walls you want to work with in your EOI. Artists must design full colour designs for us to picture the artworks on the building. 1. Proposal Brief – A minimum of 250 words explain your idea for either; Wall A or Wall B (or both). Artists are asked to be specific as you can to describe the scale, size and concept behind the artwork. Tell us what colours you will use and the process involved. 2. Support images – Designs and sketches of your proposal for this project. 3. Artist CV – Something that shows us what you have done in the past. 4. Photographs – Example of previous street art works or large scale commissions. 5. Artist budget for this project – How much will you need to cover materials, artistic labour and any other costs like safety equipment? Be as specific as you can in your budget. DOWNLOAD AN EXAMPLE BUDGET HERE. TO DOWNLOAD THIS INFORMATION AS A PDF, CLICK HERE.